Reflect the style and personality of your facility on the dials of your Primex clocks with our selection of dial options. 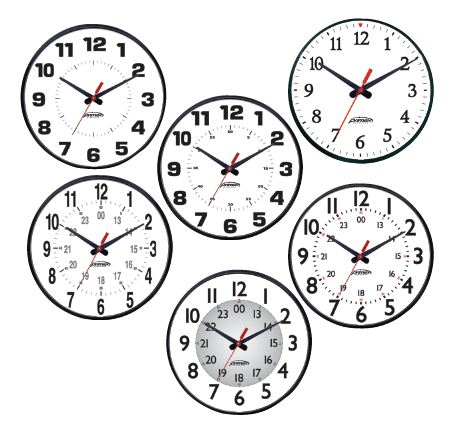 These alternative numeral styles with coordinating hands are available for no additional charge on all 9” (22.6cm) and 12.5” (31.75cm) Traditional Series Analog Clocks. Questions? Call 855-557-0337 to speak with a Primex representative. Smart building automation through time sync. Our technical support staff is on-call to answer any questions you may have about the maintenance and installation of our products. All the information you need to specify Primex products into your next building project.